2019 Hillsboro High School Athletic Hall of Fame inductees Jarrod Hart(left) and Julie Kiefer (middle) pose for a picture at halftime of the Indians varsity basketball game on Tuesday, Feb. 5, with current HHS Athletic Director Dave Dietrick. 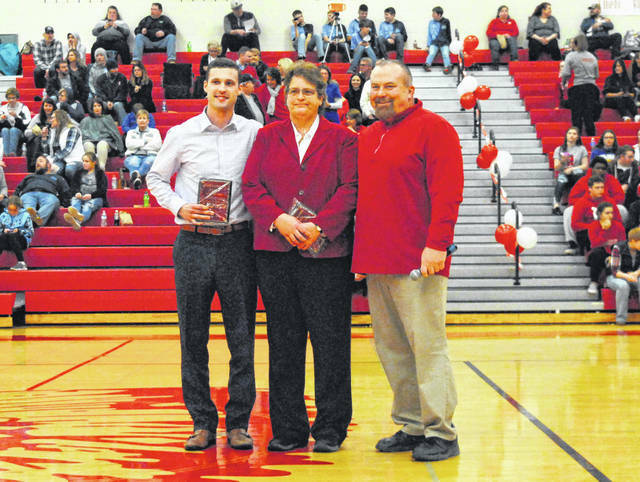 On Tuesday at Hillsboro High School 1981 graduate Julie Kiefer and 2013 graduate Jarrod Hart were honored for their athletic endeavors as the newest members of the HHS Athletic Hall of Fame. Kiefer was a three sport star at Hillsboro and earned varsity letters in Volleyball and Softball all four years of her high school career. In volleyball Kiefer was selected as the MVP of the Lady Indians and was selected two times for All South Central Ohio League (SCOL) honors. She was a four time All-SCOL performer in softball and also received the Best Defensive Player Award while suiting up for the Lady Indians. Kiefer also found great success on the basketball court as a three year letter winner with the Lady Indians and she was honored her junior and senior years with All-SCOL selections for both seasons. Kiefer finished her basketball career as the team record holder for most rebounds and best field goal percentage. Julie attended Mount Saint Joseph University on a scholarship for Volleyball and Basketball and is seen as one of the early pioneers for women’s athletics in a time when scholastic female sports participation was beginning to grow and expand. Hart earned a total of 12 varsity letters during his four years at Hillsboro High School with four being awarded for track, three apiece in basketball and soccer and one each in football and cross country. Jarrod was an exceptional track athlete and won three SCOL championships in the 800-meter run, two SCOL championships in the 1600-meter run and one championship apiece in the 400-meter dash and 4×800-meter relay. Hart was also a two time district and regional champion in the 800 while also recording league and district records in the event. He placed sixth in the 800-meter run at the state meet his junior year and second his senior year. In basketball Hart was a two time SCOL Champion and two time All-SCOL selection and was selected first team All-District on one occasion. Jarrod was an inspirational competitor and truly led by example. He wore many different hats throughout his athletic career and every coach wanted Hart on their team because of the effort he displayed in practices and competitions. Hillsboro High School provided the information for this story.